Whether you're in the air for an hour or a day, you shouldn't have to settle for the uninspired cocktails on the airplane menu. 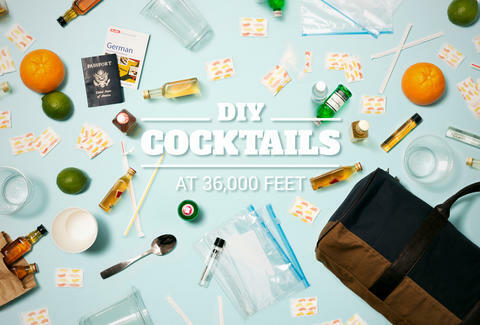 With just a few ingredients (and booze) you can pack in your carry-on, you'll be able to whip up cocktails that'll make you feel first class, even if you're sitting in coach. 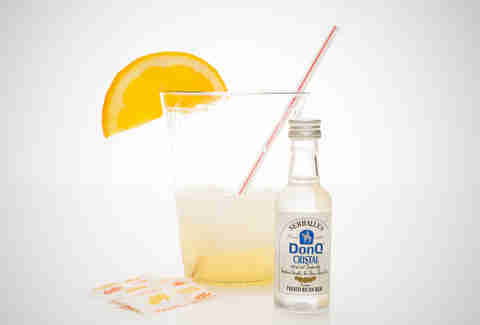 Now to be clear: packing mini bottles of booze and other ingredients in your carry-on is totally legal. Opening booze up on the plane, however, can get you into a heap of trouble. So while this guide explains how you could do it, it's NOT saying you should. That's up to you. With disclaimers out of the way, we talked to Trevor Alberts, the head mixologist at Orange Blossom in South Beach, to give you four craft cocktails you could make on a plane. First, here are five things you'll need to do this right. Sure, the airline sells them. They also just charged you $25 to check your bag, so handing them even more cash shouldn’t be the first thing on your on-board “to do” list. Also, the beverage cart is not a hipster whiskey bar, so it may not have everything you need. Containers under 3.4oz are OK by TSA, so long as they fit in a quart-sized Ziploc bag. Technically, you're not allowed to drink your own booze on the plane, but if you’re cool about it and/or sit in a window seat, you’ll have to get in a fight with someone reclining their seat in front of you to really draw attention to yourself. Those tiny airline cups barely fit a third of a soda, so adding liquor to that cup is going to make a mess. You can either use your souvenir cup from SummerSlam 2012, or pick up extras from Cinnabon (or another fast food joint -- but, yeah, Cinnabon) in the terminal. These can also double as shakers, but again, try not to draw attention to yourself. Best to bring these from home. But if you forget them, hit the airport bars. Is walking into an airport bar and asking for garnishes awkward? Possibly. Then again, you’re about to mix your own drinks on a flight next to total strangers who may or may not immediately judge you as having serious drinking issues, so that should be the least of your concerns. Just walk by the coffee shop in the terminal and load up. With $6 lattes, they can afford it. A giant swizzle stick is nice, but get a TSA agent on a bad day and it may well be confiscated. If a shaker is a little much for you, just pack a sturdy metal spoon so you're not suspiciously asking the flight attendant for dinner ware with your Diet Coke. Even a sturdy straw can work. Prep: Without being “that guy” who asks for water immediately upon boarding, politely ask for a quarter cup or so of hot water, and put three sugar packets inside. Let that dissolve, mix it around and… VOILA! Simple syrup. 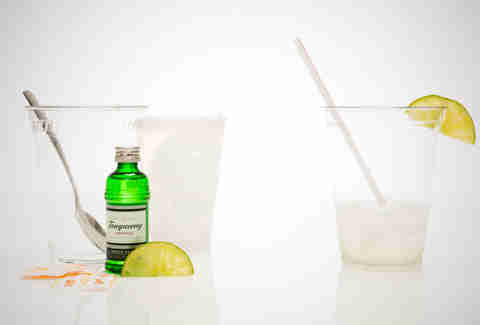 Put that to the side and squeeze three lime wedges into the empty cup and add simple syrup. Pour the entire contents of the gin miniature into the glass and then fill the glass with ice until the liquid sits about 1/4" below the rim of the cup. Stir briskly with a stirring straw or two for about 5-7 seconds, then taste the cocktail. Prep: Take that simple syrup you may or may not have used for a gimlet and combine it with the juices from whichever fruits you’ve opted to flavor this daiquiri. Pour the rum into that mixture, then steep the whole thing over ice. Transfer the mixture from cup to cup as a sort of makeshift shaker, and see if the flight attendant has an umbrella you can use for a garnish. Prep: Take a miniature of Irish whiskey with a cup of coffee about 3/4 of the way full. Add a packet of sugar to the coffee and stir until the sugar has dissolved. 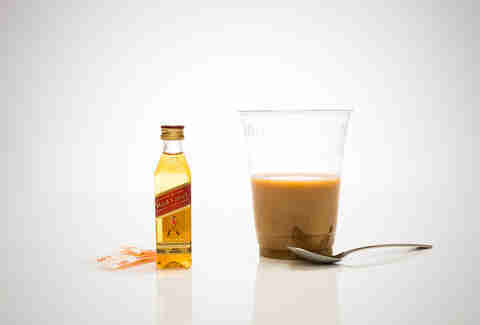 Add two creamers to the coffee and the miniature bottle of whiskey, and stir again. Prep: Créme de Cassis doesn't come in mini-bottles (hear that, liquor companies? Market opportunity! ), so you'll need to bring your own. Nowadays, drug stores sell those TSA-approved vials for carry-ons. Buy yourself a mouthwash container, then dump it out, and refill with booze. Boom. Order the ginger ale and an extra cup. Squeeze three lime wedges into your drink, then put the crème de cassis in the empty cup. Pour both into the large cup, and there you have an El Diablo.